In regards to the chapter house – the alumni board has cleaned up the first floor and should be ready for the undergraduate chapter to use for meeting space. The next project is to rehab the basement level for the undergrads to use for additional public space. This will be done over the next year. Then we will move to rehabbing the 2nd floor living quarters then the 3rd floor. The undergrads won’t be moving in until some time has passed and the chapter running smoothly. As far as visiting the chapter, there are standing chapter meetings on Monday nights at 9:05pm where our team from HQ goes over chapter training. If you are interested in meeting the undergrads and sitting through one of these sessions please feel free to reach out to me. I apologize for the lack of communication but should you have any further questions please feel free to contact me. We are working on improving and getting you news about our chapter more regularly. Also, if you would like to volunteer as a mentor to an undergrad or to be on the alumni board please reach out to me. Things are getting brighter and more real, especially when you see the progress our team from HQ has made and get to meet the new undergrads. Its all coming together and our chapter will be back again soon. I just want to inform all of you that on August 6th the 1st year students will be on campus and the fraternity will be open once again. So we have less than a month to get the house looking its best. We are looking for volunteers to help during the last week of July and the first weekend in August. Please see the attached flyer and come down and put in a few hours to get the house looking great. 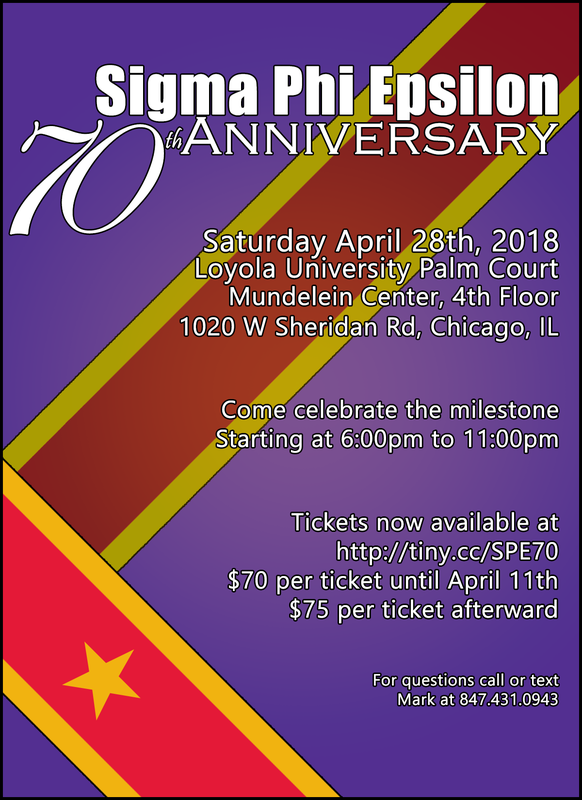 Brothers, come join us on Saturday April, 28th to celebrate our 70th Anniversary. Rejoice in the nostalgia, stories, and company of Brothers young and old. We'll also be sharing exciting updates about our return to campus this fall! Below is a digital version of the invite going out via snail mail, and a link to the event page where you can find more details and get a jump start on your registration. Looking forward to a great evening with all of you there! We hope everyone is surviving the winter! We are slowly working towards having the house open for the Fall session this year. Our first event that we will be having this year will be 70th Anniversary and we are hoping that we have quite a turnout this year. We are hoping to have the invitations sent out at the end of the month so be on the lookout! We have tentatively scheduled the event to be on April 28th but we are still working out the details for the event. We are still in need of volunteers for this event so please contact Mark Chauhan markus.chauhan@gmail.com if you are interested. We are not asking for much time but anytime it greatly appreciated. We have brought on a general contractor to help get the house up and running. That work will be ongoing for the next 2-3 months which will get us to the next phase of the fraternity recolonization effort. We are also planning on a clean-up weekend at the beginning of the summer to finish up our work done in the previous clean ups. The biggest thing everyone can do is get the word out to all our brothers so that we can keep everyone in contact with what is going on. We are a long way from having everyone's most recent contact information. haven't done so. We've added 30 alumni!! PS - We have been going through our list of alumni and month by month are trying to find contact info by decade. This month we are going through the 90's. If you haven't been getting emails from us - please send an email to anyone of us above if you can help or consult our facebook group page for further info. I'm exited to announce we have taken a large step forward in the process to recolonize our chapter at Illinois Tech. After many talks and official presentations to the IIT expansion committee, greek community, and general staff/student body - We have been officially approved by the IIT expansion committee and the undergraduate greek council to start our recolonizing efforts starting FALL 2018. This buys both sides more time to prepare for our return. The Alumni Board will be working with the expansion team at SigEp HQ throughout the spring and summer to lay the ground work for a successful launch. We will also be continuing our effort to rehab the chapter house in time for our expansion team to move in. In the meantime while we move forward please remember we will need your support. Please find the following links below to contribute funds or to donate your time. Also, please join us and connect with long lost brothers and get up to date on our recolonization process as we host another Alumni Meetups on Saturday November 11 & Saturday November 18. Please read below to hopefully answer some more question you may have regarding the state of the chapter, chapter house, and the steps required to recolonize. If you have any further questions you can join us at our upcoming alumni events, where you can talk to members of the board and catch up with brothers you may have gotten out of touch with. See below for more info. As many of you might have known the Alumni Board and IIT have been in and out of the courtroom trying to settle disputes over our contract. Last year the Alumni Board and IIT came to an agreement and settled our dispute. We will continue to operate without any changes to the contract. Our agreement opened up the door for us to start the process of recolonization to bring back our chapter. Although the agreement does stipulate a timeframe and number of members we need to have in that timeframe both the alumni board and SigEp HQ (Nationals) are confident these can be met. The following are steps required to recolonize our chapter. 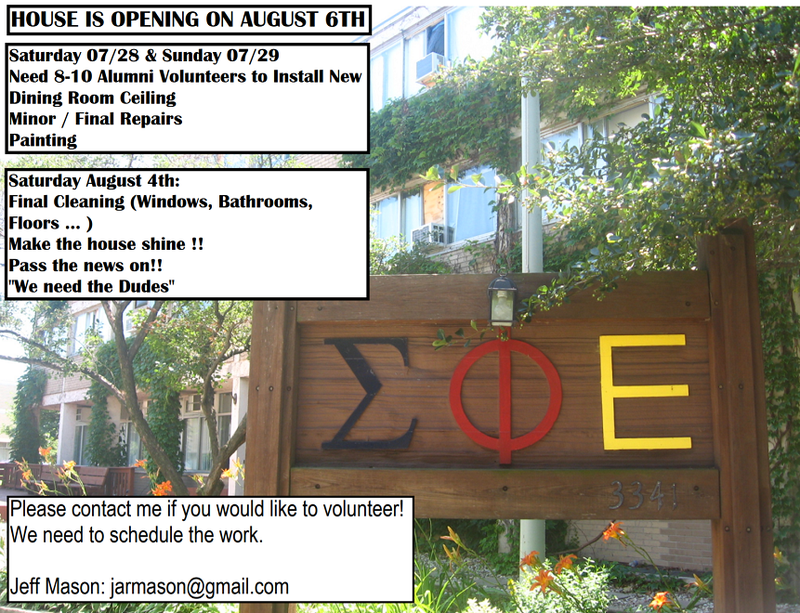 There will be a professional team from SigEp HQ full-time on IIT campus starting this Fall to get the wheels in motion. Then starting Spring 2018 semester the new SigEp colony will be formed. After 1-2 years the colony should have met all the requirements and will be officially rechartered. Recruit volunteers to be on mentoring board where each volunteer will be matched with 1-on-1 with a chapter leader. Raise money to pay for our share in recolonization ($15k). This is due by the end of the Spring 2018 semester. Raise money to fund major scholarships. Host a balanced man scholarship banquet and award scholarships before the chapter is recolonized. Host rechartering banquet (to be paid by the alumni board) when the chapter is ready to be recolonized. Any and all donations are greatly appreciated as we move forward with this long overdue endeavor to recolonize. In addition to donations, you’ll read within the newsletter that we will be having a cleanup and repair weekend. There will be many opportunities like this that will allow all brothers to participate and help us keep costs down as we are moving forward with understanding what renovations will be required. Thank you in advance for assisting with all means you are able. The Alumni Board is excited we have turned a corner and we will soon be mentoring our younger brothers in short time. After five years of our chapter being dormant we are happy to announce we will be starting the process to recolonize our chapter starting Spring 2018. We have been working closely with SigEp nationals and have their full support and resources to make this process a success. With that said we need your help with things like organizing alumni events, rehabbing the chapter house, raising funds, mentoring, etc. Unfortunately, our alumni communications need to be rebuilt so we can effectively keep all our brothers informed. Please register (at right) to get your current name and email address onto the mailing list to help rebuild the alumni database and be the first to stay up to date with the latest news. Also, please spread the word to all our chapter brothers. Join this mailing list to stay informed on our progress!